The sterile environment of a theatre complex, out of necessity, is not a welcoming and warm place. For your safety the walls are bare and unnecessary furniture is not allowed beyond what is needed to perform the procedure. 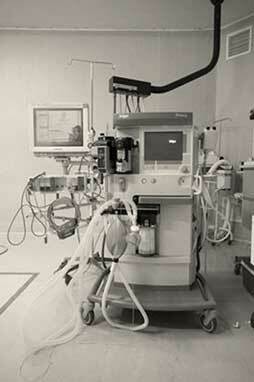 Operating theatre equipment is designed with functionality in mind and is not known for their aesthetic qualities. Specialists dressed in sterile clothes appear drab and wear caps to keep hair covered and face masks, which often make them appear unfriendly and forbidding. Specialists and theatre staff are, however, used to these surroundings and to them it is a welcoming, well-known area in which they make their daily living and they see past the drab surrounds. It is important to realise that the drab and seemingly severe surrounds are merely a function of necessity for your safety and well-being and the specialists despite their environment, are just ordinary people going about their daily task. It is important to know what the different pieces of equipment in theatre are and how they will ensure a safe and successful procedure. It is also important to understand the routine in theatre and what process is followed. This will reduce your anxiety and uncertainty and will make it an interesting and informative experience, rather than an alarming one. It is important to visit the hospital prior to your procedure to familiarise yourself with the ward, the theatre and the recovery area as well as enquire as to exactly what will happen on the day of your operation. Most hospitals employ a public relations officer or client services manager or have a pre-admission clinic to assist you with these arrangements. The following information will illustrate a typical routine visit to a hospital for an elective procedure, with illustrations of some of the equipment that will be used during the procedure. It is typical that if your operation is scheduled in the morning that you will be admitted to the hospital very early in the morning. It is important therefore to have the household well prepared for this. Your spouse, friend or family member will ordinarily accompany you to the hospital and this will obviously mean that work related matters as well as childcare matters are arranged timeously. The first port of call will be the admission desk where certain paperwork will have to be completed. This is usually to administer the hospital account. You will need to ensure that you check beforehand what kinds of documentation will be required. This will typically include identity documents, medical insurance authorisation, agreement to co-payments, guarantee of payment and may even include a cash deposit. Most institutions have pre-admission facilities where this can be dealt with during office hours before the admission date, making the admission process easier on the day of your procedure. You will be taken to the ward and made comfortable in your bed. A member of staff will take your blood pressure, temperature and weight. You will also be asked specific questions about your health, possible allergies to medication, previous anaesthetic complications and whether you fully understand your planned procedure. Many of these functions will also be performed at a pre-admission clinic, streamlining your admission. You will be given a theatre gown to wear, which fastens behind your back and is not very flattering, but specifically designed to be functional. The anaesthetist will consult and examine you in the ward to ensure the use of the safest and most appropriate anaesthesia based on your history, examination and planned procedure. Your valuables may be locked away by the staff for safe keeping. You will be informed of your approximate time for theatre, but you have to be aware that this may not be accurate and your operation may even be delayed for several hours as theatre lists can be prolonged by many technical factors as well as emergencies. You will be fetched by a porter and brought to theatre on your bed. It can be quite disconcerting and most people become quite anxious. To reduce anxiety a light sedative is frequently administered in the ward as prescribed by the anaesthetist. At the theatre doors, you will be handed over to theatre personnel and they will verify with the ward staff that you are the correct patient and that you have been booked for the correct procedure. They will also ask some basic questions and verify that all false teeth, jewelry and aids have been removed. You will then be taken to a waiting area. When it is your turn, you will be taken from the waiting area to the operating theatre. In theatre you will be helped onto the theatre table. An anaesthetic nurse will connect an oximeter, by means of a soft rubber hood that is placed on your finger, which measures the oxygen concentration in your blood. The nurse will also connect a blood pressure cuff to monitor your blood pressure and place ECG (electrocardiogram) stickers on your chest that will monitor your heartbeat throughout the procedure. The anaesthetist will place a drip needle into one of your veins and start an infusion (drip). A breathing mask will be held over your mouth and nose with an odd smelling gas to be inhaled. This is the anaesthetic gas that will anaesthetise you. You will remember very little about this part of the procedure. A breathing tube will be inserted into your windpipe (trachea) through your mouth if you are going to have a full anaesthetic and a ventilator will control your breathing for the duration of the procedure. Once you are anaesthetised, care will be taken to protect your eyes and any part of your body that may experience direct pressure for a prolonged period. The skin surrounding the area where the incision is going to be performed will be prepared with an anti-bacterial solution. The specialist and scrub sister will do the same by washing and scrubbing their hands with anti-bacterial solutions and scrubbing brushes. They will then don theatre gowns and face masks. The operation site and the rest of your body will be carefully draped with special sheets to cover the areas that have not been cleaned. Your operation will be performed under the strictest sterile conditions possible. At the end of the operation a drain may be placed in the wound to drain away any excess blood and body fluid to ensure that the wound heals properly and the skin edges are closed with sutures, metal surgical clips or even surgical glue. You will be moved over to your bed with a roller-board and taken to the recovery room where you will be kept until fully awake. You will be transferred to the high care unit or the ward. If you spend the night in the high care unit, you will be transferred to the ward as soon as your specialist is confident that it is safe. This machine has a supply of different gases including oxygen, ordinary air and nitrous oxide and mixes anaesthetic gases into the flow of oxygen and air mixture that is pumped into and out of your lungs by the ventilator. The machine also removes the carbon dioxide that you exhale. The canister at the bottom of the tray with the granules inside is responsible for removing the carbon dioxide. There are valves that regulate the flow as well as flow meters to indicate the flow rate. Soft tubes connect you to the machine to deliver clean air and gas mixture and to remove the air that is exhaled. The machine has an extensive monitoring function to perform and measures the amount of the different gases that enter and exit your body, the concentration of oxygen in your blood, your heart rate and rhythm and your blood pressure. It has several alarms and fail-safe mechanisms to keep you safe and to alert the anaesthetist of possible complications. This mobile X-ray machine is used extensively to confirm the anatomy and position of the bony structures of the spine as well as confirming that the level of surgery performed is the intended level. It is also used to confirm that spinal instrumentation is properly inserted and fixed. This machine has a supply of different gases including oxygen, ordinary air and nitrous oxide and mixes anaesthetic gases into the flow of oxygen and air mixture that is pumped into and out of your lungs by the ventilator. The machine also removes the carbon dioxide that you exhale. The canister at the bottom of the tray with the granules inside is responsible for removing the carbon dioxide. There are valves that regulate the flow as well as flow meters to indicate the flow rate. Soft tubes connect you to the machine to deliver a clean air and gas mixture and to remove the air that is exhaled. The machine has an extensive monitoring function to perform and it measures the amount of the different gases that enter and exit your body, the concentration of oxygen in your blood, your heart rate and rhythm and your blood pressure. It has several alarms and fail-safe mechanisms to keep you safe and to alert the anaesthetist of possible complications. This mobile X-ray machine is used extensively to confirm the anatomy and position of the bony structures of the spine as well as confirming that the level of surgery performed is the intended level. It is also used to confirm that spinal instrumentation is properly inserted and fixed if there is any instrumentation required for your procedure. It has two heads fixed on a C-arm (B) and this generates and receives the X-ray beams. The screen (A) shows the resulting images and modern machines have recording functions and can even measure distances. Many operations to the spine require that the different types of tissue are magnified so that the specialist can discern the nerves from the other tissues. Some specialists use operating loupes, which are special glasses that have telescope-like lenses that magnify the tissue. Other specialists use an operating microscope, which is a large machine that both illuminates the tissue and also magnifies the tissue more than an operating loupe. The operating microscope is frequently used in spinal surgery as a light source and magnifying instrument so that the specialist can clearly see the tissue and especially the nerves when operating. 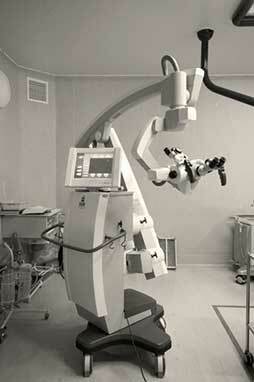 Modern microscopes are magnificent machines and are very easy to use and have multiple functions such as navigation abilities to steer the specialist through different tissues, recording abilities, the ability to take pictures and a host of user specific settings to make surgery a safer procedure. Some specialists prefer to use a headlight that is attached onto their forehead by a headband for illumination and operating loupes for magnification. Loupes are cylindrical mini telescopic glasses that can be attached to a pair of spectacles or the headband of the headlight to allow for magnification of the tissue. 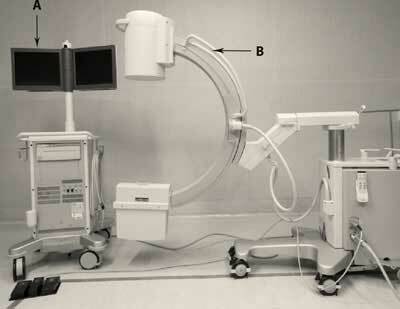 The picture above demonstrates a regular set-up in a spinal theatre. 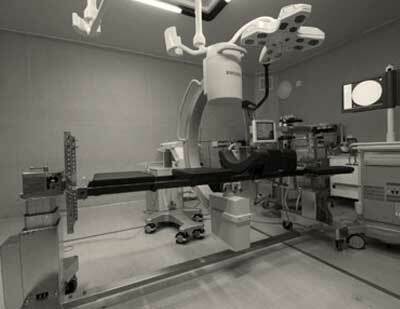 The theatre table in the foreground is a specialised spinal surgery table which is composed to a large degree of carbon-fibre and has no central supporting post. This allows for the X-ray machine to pass underneath and for the X-rays to penetrate through the table, allowing the specialist to visualise the anatomical structures and instrumentation used in spinal surgery. Note the X-ray machine in position as it would be utilised during surgery. The screen is positioned at the top-end of the table so that the specialist can see it comfortably without having to turn his head. In the background the anaesthetic machine is positioned close to the patient’s head for optimal safety, so that the anaesthetist is as close as possible to the patient’s all important airway. It is important to understand that there are many variations on this theme and that your specialist might utilise a completely different set-up for technical and practical reasons that prevail in your area. Most spinal specialists will use a specially designed theatre table made out of carbon-fibre, which is designed to allow the specialist to use the C-arm to see the vertebrae and any instrumentation used, without interference from the metal of an ordinary operating table. There are movable pads for the patient to lie on so that they do not develop pressure sores. The table is also adjustable at different angles and heights to assist the specialist to see the tissues of the spine more clearly and to operate in a comfortable position. The diathermy machine is used to coagulate bleeding blood vessels and is used to dissect tissues with. It makes use of an electrical current and can generate enormous amounts of heat at the tip of the working probe. In long and complicated spinal procedures or procedures in which moderate to severe blood-loss is expected, a cell saver may be used. This is a device that is connected to the suction unit and all the blood that is sucked up during the procedure is washed inside the machine in a saline solution and impurities are removed. The blood can then be given straight back to the patient through the drip. In some procedures and especially in scoliosis surgery, this technology may be used. Scoliosis is where the spine is bent and has to be straightened with rods and screws. This may place the nerves under stress and this system will warn the specialist if the nerves are being compromised and will allow the specialist to modify the procedure to be able to protect the nerves. There are, however, definite technical challenges to this technology at this stage. Some specialists use a computer that helps them identify the different structures and is useful in placing screws in the correct position away from the fragile nerves. These computers use a system of known reference points to calculate where the specialist’s instrument is in relation to the tissue.